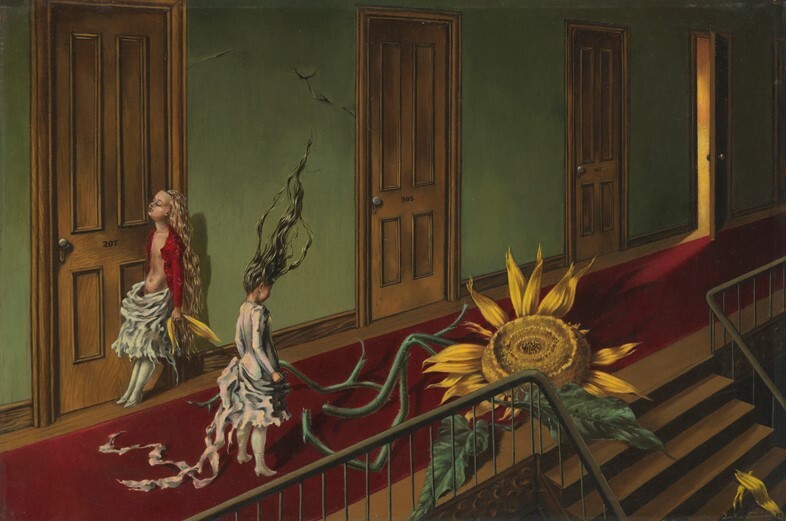 American artist Dorothea Tanning refused to be confined by labels. “Women artists. There is no such thing – or person,” she famously declared. Similarly, while she is most frequently categorised under the “surrealist” bracket, thanks to the dreamlike imagery, fantastical landscapes and inexplicable happenings that punctuate her oeuvre, in later life she said, “I still believe in the surrealist effort to plumb our deepest subconscious to find out about ourselves. But please don’t say I’m carrying the surrealist banner”. Instead, as a new retrospective at Tate Modern strives to illustrate, Tanning was an artist who challenged convention at every turn – through painting, costume design, soft sculpture, poetry, prose and more – across her seven-decade-long career. Tanning was a self-taught commercial artist, newly relocated to New York from her sleepy hometown of Galesburg, Illinois, when she first encountered surrealism at the Fantastic Art, Dada, Surrealism exhibition at MoMA in 1936. She described “the limitless expanse of POSSIBILITY” its artworks, by the likes of Marcel Duchamp, Meret Oppenheim and her future husband Max Ernst, evoked. But while Tanning was undoubtedly struck by the ideas and stylistic tropes of the predominantly male, European movement and its studied expression of the unconscious, her own work, in the words of the Tate Modern show’s co-curator Ann Coxon, “expands its legacy through its ongoing exploration of the same themes – like domestic and family life, flesh and bodies – to uncover the things that lurk in the shadows or behind the closed doors: the taboo”. Where many male surrealists have been criticised for their depiction of women as passive objects of desire, Tanning’s frequent female protagonists are possessed of entirely different qualities. Take Birthday (1942), a self-portrait which finds the artist in a “Shakespearean” dress, the bodice ripped open to reveal her bare breasts, the skirt a tangle of branches and drapery. At her feet sits a strange winged creature, while behind her an endless series of partially open doors is reflected in a mirror. She is the active participant in her own strange venture into the unknown, standing poised and upright, her sexuality entirely her own. In the mid-1950s, Tanning’s painting style underwent a significant change, veering towards abstraction, becoming looser and freer – although, Coxon explains, “there’s always the suggestion of bodies and an interest in domestic space”. In these more sensuous, distorted works, the viewer has to work harder to decipher the “unknown but knowable states” that Tanning proclaimed herself determined to convey – as per her 1964 work Chiens de Cythère, which requires close inspection to reveal the figures and limbs emerging from the painting’s voluminous masses. In the 1960s, Tanning took to soft sculpture to express her ever-evolving vision, creating biomorphic pieces from textile, stuffing and found objects, some 20 years before Louise Bourgeois or Sarah Lucas offered their interpretations on the medium. Again, many of these evoke a distortion of the female figure, to tactile, often troubling effect. The climax of this progressive period though was Tanning’s Chambre 202, Hôtel du Pavot (1970–3), a diorama which can be approached but not entered. Inside this eerie chamber, stomachs and rears burst through the floral wallpaper, while the fireplace, armchair and table sprout tumorous limbs. “It’s something else,” says Coxon – and indeed, the work, and the sickly sense of dread it invokes, still feels startlingly radical nearly 50 years on. Tanning was such a trailblazing spirit – especially in her subversion of gender expectations and identity – that it’s difficult to avoid viewing her work in a feminist light. But, Coxon says, the artist would have shunned this interpretation in favour of being seen on her own terms. And indeed, above all, the exhibition reveals Tanning as a pioneer with a truly strange and singular vision; one which she was compelled to share by any means available to her, turning finally to writing and poetry in the last decades of her extraordinarily multifaceted life. 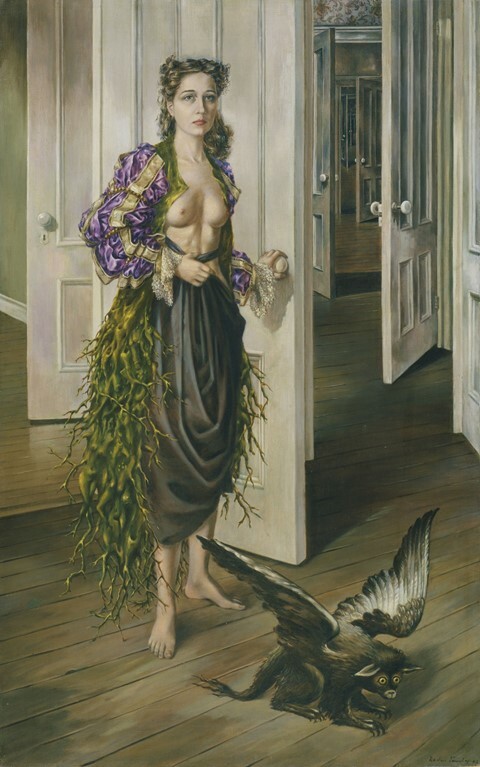 Dorothea Tanning is at Tate Modern until June 9, 2019.